Yesterday I told you about my amazing visit to the opening of Harry Potter: The Exhibition, but that was only half of the story. In addition to visiting the Mecca for all Harry Potter fans, I got a chance to sit down and chat with James and Oliver Phelps better known as Fred and George Weasley – The Weasley Twins from Harry Potter – about they experiences as part of one of the world’s most famous and beloved film series. 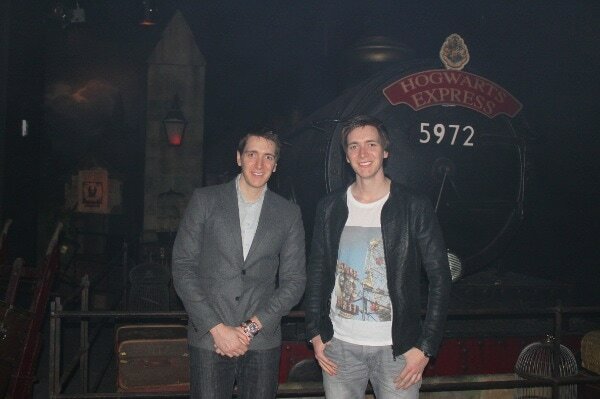 Pictured above are James and Oliver Phelps, better known as Fred and Weasley in the Kings Cross Station Set at Harry Potter: The Exhibition. I asked Fred and George Weasley… I mean Oliver and James about their casting process. How exactly where they chosen to play Fred and George Weasley??? We heard there was an acting audition going down and it was advertised in all the national papers so we thought, “Yeah, why not? Do they need any twins, roughly our age, give it a go?” and it went from there. We turned up at this hotel and people were there for all sorts of parts in the film and it was the first time we’d ever seen the stage mom. We didn’t even have clothes on that were identical. You see all these identical twins in exactly the same things and we thought “we should probably go to a shop and get some shirts” so we did that and then we got there and we see all these portfolios that people have in these huge ring binders “here is my action shot, here’s my cold shot, my sad face” and we were like “this is a Polaroid of me, standing outside in the hallway with a shopping bag.” But I think they liked that. A lot of the guys it was our first thing or one of the first things we’ve done so we were all new in it together. What about souvenirs? Did they keep any from the Harry Potter set? You couldn’t keep any props, not legally. But the coolest thing I got was a bag from Weasley’s Wizzard Wheezes. That was pretty cool, it’s framed in my bedroom. It’s quite simple but it means a lot to my character. They pretty much took everything as you can see it’s in the Exhibition but I managed to keep a coin from Gringotts [Bank] and it’s actually detailed on both sides so that’s pretty cool to have. I have to be honest. Fred and George Weasley are simply two of my favorite characters from the Harry Potter Movies. It was such a treat to get through this interview! While sitting there asking these questions I had to wonder what I would do if I was on set. What would I do as part of the Harry Potter franchise? And of course, I would want to take home part of the magic. Did James and Oliver feel the same way?? Fred and George Weasley… I mean James and Oliver had a dream prop they wanted to take home. Guess what it was?? My wand. Because every wand is unique to the character but they were very strict on that. But I broke three of them so that’s probably why I wasn’t allowed any more. We all wanted to know how they found out Fred Weasley, played by James, died in the final film. I read it in the book. I got the book when it came out and I discovered it whilst reading the book, which was an experience and a half. I was in Japan, actually, and I read it on the bullet train just as the guy asked me for my ticket and I was like “I’m just dead. Give me a moment here.” So yeah, that’s how I found out. And how was it for Oliver and James Phelps ( Fred and George Weasley) to get through Fred Weasley’s death scene? Easy for me, I just lay there. It was pretty intense, yeah. We did about five takes. Although I’ve seen lots of weird stuff people have sent me on twitter like, “At the end of this scene Oliver was so overcome with emotion that he hugged James and said I love you.” As opposed to “going to lunch” which is how it really was but I think people play it out in their heads “oh that’s so nice and sweet” but it wasn’t really. It was emotional in one sense because you’ve got to work yourself up into a state to be crying, but in another sense it wasn’t this whole “love you man” all like that hugging let’s go for a nice drink together, none of that. It was very much once it was done, it was done. What is the pair working on now that Harry Potter has ended? I can’t believe there will be no more Fred and George Weasley pranks on the big screen. WAH!!! I’ve been quite busy with my website, actually, which has been going down really well. It’s called www.jopworld.com mainly about travel, places I’ve traveled, what I recommend to people to do, and I’ve had some great feedback from people. I did a triathlon as well, so there’s a training regime to that. So that’s been keeping my busy as well in addition to doing auditions. I just did a stage show in London, The Boy Who Was Woody Allen which was cool. It was my first ever show. I always though my first thing would be a bit part, but I had the lead and I left the stage once in two hours and had to learn 46 monologues. It was good, I really enjoyed it and I really want to pursue theater now because of it. I really love the ego boost you get from the audience cheering you every night, it was good fun. 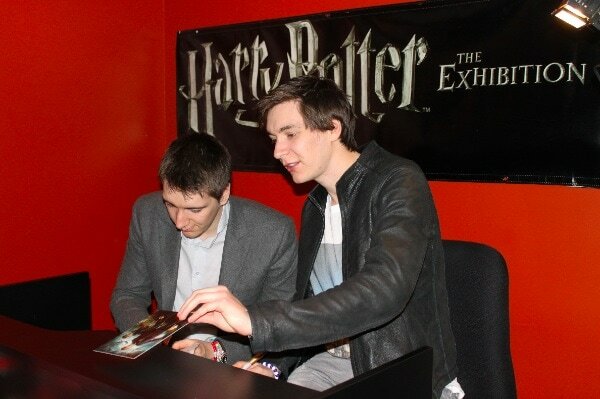 Pictured below, Oliver and James Phelps signing autographs for lucky fans at the opening of Harry Potter: The Exhibition at Discovery Times Square. So many Fred and George Weasley fans showed up! Harry Potter: The Exhibition will be in New York until April 7, 2013. For more tickets and more information vist Harry Potter: The Exhibition online. Need more Harry Potter and just can’t wait? Click here to read my review of Harry Potter: The Exhibition. Are you Fred and George Weasley fans? Fess up in the comments below!